At Braeside, we have the talent, tools and processes to turn your idea into a finished display, on time and within budget. Braeside Displays has simplified the assembly and fulfillment process, giving our clients the fastest, most worry-free, and cost effective customized display solutions available. After you tell us about your project, our creative and production teams will determine the best method and materials to produce your display. Backed by our 80,000 square foot facility, seasoned project managers, state-of-the-art software and a +99% history for on time fulfillment, Braeside can stock and ship directly to your specific location(s). Our highly trained teams are professionally organized to assemble your products and other display components from start to finish. This turnkey approach reduces unnecessary handling, saves you money and helps ensure quality by controlling the process every step of the way. Our team of talented designers and engineers put years of experience in every display we produce. We fully listen to our client's requirements and concerns when developing and communicating new ideas that will maximize display efficiencies. Our processes provide a clear understanding of production requisites so clients can make informed decisions prior to placing orders. Many customers have learned the hard way that great looking drawings aren't always buildable. Our design software verifies that every design can be reliably built before the first units are ever made. Braeside's certified Computer Aided Design (CAD) operators use state-of-the-art technology to create complex 3D renderings of your product, enabling us to manufacture your display using the most appropriate materials in the most cost effective way. Our highly skilled team of engineers delivers over 45 years of display production experience. We'll determine the best methods and materials for your displays. We're committed to developing a custom prototype quickly after our initial conversation, so you can see the design and functionality of the custom display before you place your order. 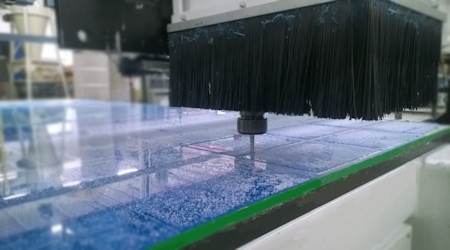 CNC routers cut large sheets of plastic into many identical smaller parts with incredible speed and accuracy. They run around the clock, reduce waste and eliminate human errors. Vacuum forming is ideal for creating contoured three-dimensional shapes from a single panel of plastic. In less than a minute, integrated equipment efficiently "cooks" a sheet of plastic and then "forms" this malleable pane into a custom design that's right for you. Our high powered laser beams can intricately cut unusual shapes and simultaneously polish the edges of a wide variety of display material. Computer controlled lasers are accurate to within 10 micrometers — less than the width of a human hair. This method is the most cost effective way to convert plastic resin into finished parts. This process is perfect for producing display components with fine features or complex geometries at the lowest possible costs in high volumes. Braeside's molding presses range from 250 to more than 600 tons of pressure. Many of the point-of-purchase displays we create require bending of the substrate to meet certain development requirements. We have the capabilities to apply structural flexure for a variety of plastics. This capability ensures we can produce display variations regardless of their complexity. This state-of-the-art process uses ultra-sonic vibrations rather than glue, rivets or screws to join together various display components. With robotic assistance, welds are ten times faster and are up to twice as strong as conventional assembly methods. When gluing components is required, we have a variety of resins that we use to match the material needing adhesive. This ensures a strong connection for all display elements that is resistant to separation and local discoloration. Similar to the process used to cut dough with a cookie cutter, die cutting is a method for punching out unique shapes by using a metal form called a "die". With perfect repeatability, our 50 ton press can cut out detailed plastic, chipboard and aluminum shapes at the lowest possible cost. Digital printing allows us to print a digital-based image directly to a variety of media. Using our large-format and high-volume laser printers, we can provide an alternative to traditional offset printing methods, keeping costs down and quality high. No matter how large the format, within minutes we can print banners, posters and labels with our state-of-the-art 8-color digital presses. We'll save you time and money by integrating your sources under one roof, reducing your need for coordinating with other subcontractors. For creating deep, saturated colors and bold graphics, nothing beats the look and feel of silk screening. Invented more than 3000 years ago in China, the silk screening process has been ultra-refined and today is used to produce vivid, high quality graphics on a number of materials. Our kitting processes are designed to reduce material handling and processing times while improving upon assembly side procedures. This allows us to provide cost efficiencies and reduced turnaround times for each and every project. Our large warehouses ensure we have stock on hand when it is needed. We can also store finished displays in our warehouses for clients who may be short on space or where we provide direct shipping to multiple locations on a regular basis. Many of our customers not only require display production, but also request packing and shipping to their end user direct from our manufacturing facilities. Our contract packaging capability helps to eliminate time and costs associated with additional transportation and reduce lead time for in-hands delivery. Our highly trained teams and efficient supply chain management techniques provide a turnkey fulfillment option. We can efficiently drop ship from our warehouses directly to your end user's location. We specialize in drop shipping to multiple locations. Have Questions About Our Capabilities? Contact Braeside Displays via our Contact Form or by calling 847-395-8500 and we'll be happy to answer your questions. Start the process of turning your ideas into profitable custom display solutions.